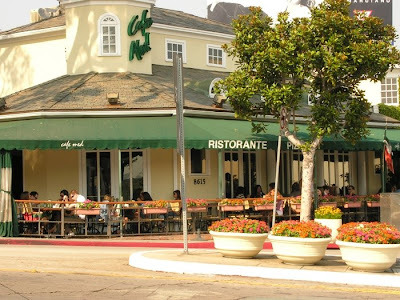 Cafe Med is a Roman-style Italian restaurant nestled into the center of the Sunset Strip. Recognizable by its olive green hangover, Café Med grandly occupies its corner of Sunset Plaza. Facing the area’s main intersection, a table on the café’s covered patio provides prime views of smartly dressed spenders on Sunset Blvd. Celeb sighting? Our girl Rih-Rih (and her forward stylist) can't get enough of this place. The menu features extensive Italian selections, from starters like pizza and sandwiches to traditional pasta dishes such as ravioli and rigatoni. 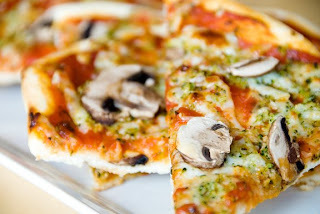 If you go during the day, try a slice of their thin crust pizza along with one of the many choices on their wine list. Located in West Hollywood, 8615 W. Sunset Blvd.